Princess Sofia just woke up in the morning and has to prepare for a new day as part of the royalty of her country. Before starting the game they will show us the clothes they will need to get dressed and we will have to hunt them when they go through the perch. Use the spacebar to select the correct clothes and continue to dress the little princess. In the lower part you will see the garment to hunt, you must do it three times to move on to the next one. Be careful not to choose the wrong clothes because the little rabbit will not like anything. 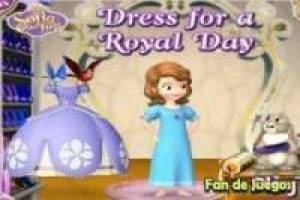 Follow the instructions in each level and complete the dress of Princess Sofia for a new real day. Enjoy the game Sofia: Dress for a real day, it's free, it's one of our Sofia games we've selected.